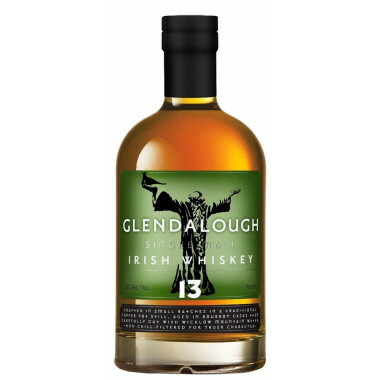 Second release of the Glendalough distillery, this Irish Single Malt aged for 13 years in carefully selected Bourbon casks. A great Irish Whiskey, worthy of the Irish distilleries’ heritage. Second release of the Glendalough distillery, this Irish Single Malt aged for 13 years in carefully selected Bourbon casks. This Glendalough Single Malt is an artist’s work and entailed hours of dedication and work to obtain this great Irish Whiskey, worthy of the Irish distilleries’ heritage. A whiskey of great class, rich with spices, creamy vanilla, biscuit malts and that unmistakable Irish influence that makes this whiskey so unique. Wishing to revive the traditional Irish distilleries, five friends from Wiclow and Dublin created the Glendalough distillery. In the 18th and 19th centuries, Ireland boasted more than 200 distilleries, which until recently dropped to a small handful. Glendalough was created to pay homage to the Irish distilling heritage. The young craft distillery produces today a range of innovative and traditional spirits, from Poitín to whiskeys and botanical gins, relying on heritage and tradition of the Irish distilleries. Glendalough is the first Irish craft distillery. Nose: deep butterscotch, honeycomb and rich lemon meringue, contrasted with citrus fruits and a hint of cloves. Palate: intense vanilla fudge and luxurious sweetness of rock candies, mixed with touches of fruits - lemon, peach and dried apricot. Finish: spicy with layers of malt and oak in the backdrop, a beautiful vanilla returns and lasts on the palate.